NETWORK UPDATE: THE VOICE gained 0.1 in final numbers, as did THE MINDY PROJECT. SONS OF ANARCHY (FX) topped the night’s cable ratings at 2.23 in 18-49s, up 0.34 in the demo from last week. The post-show ANARCHY AFTERWORD scored 1.0, up 0.13 in the demo. ESPN’s 30 FOR 30 documentary was behind SONS, at 1.05. INK MASTER (Spike) gained 0.06 to 0.82. 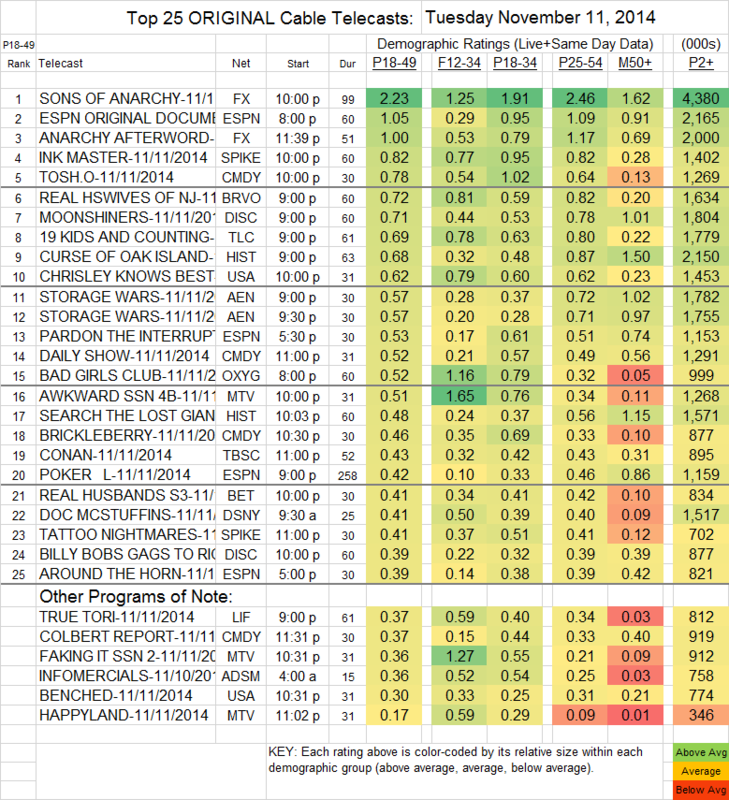 TOSH.0 (Comedy) ticked up 0.01 to 0.78, and BRICKLEBERRY lost 0.03 to 0.46. Bravo’s REAL HOUSEWIVES OF NEW JERSEY was at 0.72, with Discovery’s MOONSHINERS right behind at 0.71. There must be an explanation for why 19 KIDS AND COUNTING (TLC) lost almost half last week’s 1.21, down to 0.69. History’s CURSE OF OAK ISLAND fell 0.21 to 0.68. On USA, CHRISLEY KNOWS BEST was down a tick at 0.62, and BENCHED dropped a tenth to 0.30 (making USA’s announcement that it’s easing out of the comedy business look pretty sensible). REAL HUSBANDS (BET) lost 0.03 to 0.41. On MTV, AWKWARD gained a tenth to 0.51, FAKING IT was up 0.03 to 0.33, and HAPPYLAND was similarly down 0.03 to 0.17. The Veterans Day CONCERT FOR VALOR on HBO was at 0.31.